Our company has achieved laurels in offering Gas Suppression System to the clients. This product is commonly used to avoid fire accidents in big and small places. Offered range is extremely supportive in attaining utmost security in controlling heavy fire. Gas Suppression System is technologically assorted and mostly used in places where water can damage expensive equipments. This product is widely economical and offered within the specified time limits. Offered range is suitable to extinguish the fire caused due to several reasons such as petroleum products, short-circuits and other varied conditions. 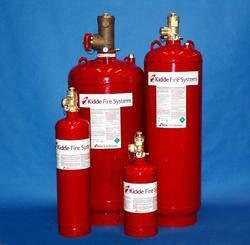 Looking for Novec1230 Fire Suppression systems ?